Taken from my other blog, Elf Yourself 2008. Today is a great day. I get to see Peter here in Singapore, a pilgrim from Germany that I have met during my first Camino back in 2006. He's here in this region visiting his business associates, and of course a fellow pilgrim (me!). It's a wonderful feeling, the bond that pilgrims share, even between different countries, age group and job industries. 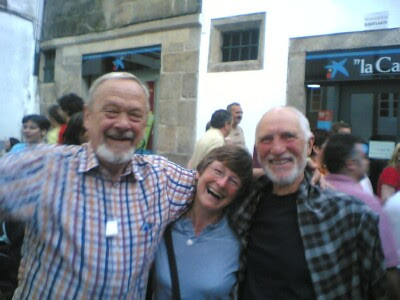 Here a picture taken in Santiago de Compostela almost two and half years ago.